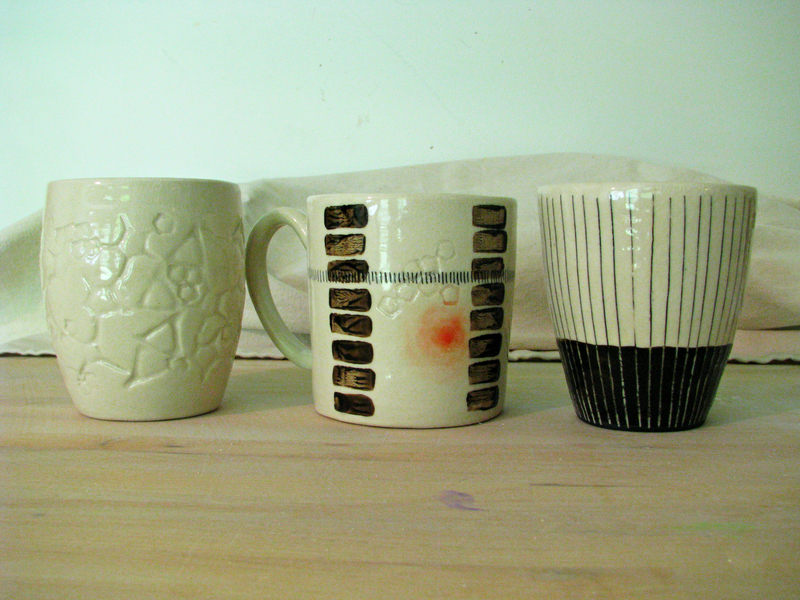 Here are a few of the things that came out of the kiln today. I sure wish they weren’t covered with a crazy amount of crazing (tiny cracks all over the glaze). They are sitting on my work table, and every once in a while I hear another little “ting” as they continue to crackle. So I still have not found my ideal combination of clay and transparent glaze. This clay had crazing problems with multiple commercial clear glazes. Unfortunately, I threw a number of things with this clay on Wednesday, so those pieces will be getting teal and green glazes for sure — no more crazing clear! I think I am going to try an Aardvark clay next — either Nara Porcelain or Bee Mix 5. I think my heart is in porcelain though. I just like throwing it. I do like Laguna Frost if neither of the Aardvarks work out. Frost just cracks on me occasionally, so if I can avoid that I will. But Frost sure is pretty. It’s so, well, frosty! One of these days I will finally have a batch of pots that looks the way I want it to and is functional! It just takes so long to experiment with the limited work time I have. This is a test of my patience for sure.